Have a question on Ghibli? Ghibli is available in 5 different colors - White, Black, Grey, Blue and Rosso Folgore. Watch latest video reviews of Maserati Ghibli to know about its interiors, exteriors, performance, mileage and more. Since Maserati's inception, the company is producing cars with unmatched performance level and the Italian Automaker is still staying true to its values by continuous building of evolutionary cars where astounding sporting performance is combined with elegance, comfort, luxury and boldness. Just like the first Ghibli launched in 1967, the current generation Ghibli captivates the customers with its strong personality. The layout of current Ghibli meets the idea of a modern luxury saloon that will help the company in enhancing the market share of the company in UAE in an effective manner. The car is available in three variants which includes Ghibli, Ghibli S and Ghibli Q4, each being sensational and highly dynamic. The 3.0-litre V6 engine of the car delivers efficient performance and the maximum power measures 330 hp at 5000 rpm alongside maximum torque measures 500 Nm at mere 1750 to 4500 rpm. The Ghibli will attract any individual with its clean lines, well defined volumes and its sporty glamor. The sleek silhouette merge into a single central form that creates a more dynamic overall line. The Maserati radiator grille emphasize the front and gives the car's nose a dominated as well as distinctive look. When seated in Ghibli, the interiors will delight you in an effective manner. The soft leather seat, upbeat upholstery and creative side panels with two tone combinations reflects a sense of pure luxury. To ensure safety of occupants, the vehicle embeds electronic vehicle immobilization device. The air bag system (front, side and curtain), Hill Launch Assist (HLA), Electronic Stability Program (ESP) and Rear as well as front parking sensors further adds to the safety features of the car in an effective manner. The fuel economy is not very impressive and Ghibli might disappoint the customers on this front, as the the figure of 7.9 kmpl is quite low in the segment when compared to other top guns in UAE market. The athletic 3.0-litre engine of the car delivers efficient performance and the maximum power measures 330 hp at 5000 rpm alongside maximum torque measures 500 Nm at mere 1750 to 4500 rpm. The all new Ghibli is exceptionally fast, that is designed to awaken your senses, no matter what terrain you are on. The 6-cylinder engine coupled with camshafts, electronic control system and turbine mapping helps the driver clocking 100 kmph mark in a fascinating time span of 5.6 seconds. The top speed of Ghibli measures between 263 kmph depending on the variant. For Ghibli, it can be stated that it is a complete opposite of ordinary. A truly unique sports saloon that is meant to stand out of the crowd due to its graceful lines, perfect proportions and its sophistication. At front, the radiator grille with company's insignia dominates the nose and the concave vertical fillets are inspired from the renowned Gran Turismo as well as Berlinetta. The closer look at the car's silhouette will reflect a host of references to the Maserati tradition which includes three large air vents behind the wheels and the emphasis on sporty glamor of the car, which is a delight to behold. Carrying along the side, the two stylish lines converge even before giving way to the sculpted forms of the rear mudguard. The LED indicator incorporated in the headlight units replicate the distinctive motif of the three Maserati signature side air vents and further improves the sharp looks of the car in an effective manner. Although the length and wheelbase of Maserati is biggest in the class, the frame-less door windows helps the car in giving the look of a sleek coupe. To the rear, the car's sporty look is further accentuated by the twin tailpipes and the tapered design of the boot is the continuation of the cabin. Ghibli is no small car, which is quite evident from its dimensions that are quite impressive to flaunt on road. The overall dimensions of the car measures 4971 mm X 1945 mm X 1461 mm (L X W X H) and the wheelbase measures 2998 mm that makes provision for ample cabin space and stability at high speed. 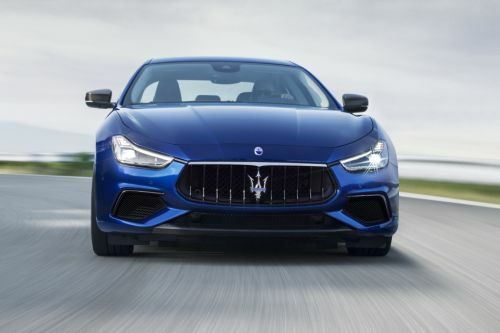 The joy of driving a prestigious top notch performance car is enhanced through its interiors and Maserati Ghibli is designed to deliver inspirational motoring experience to its occupants. The Italian Automaker has evolved Ghibli as an epitome of traditional craftsmanship, soft leather and exquisite stitching. The large speedometer and rpm-counter have elegant white back-lighting and are separated by a 7-inch TFT display that shows the car’s dynamic data. The smooth, elegant lines of the dashboard and central tuning steep the occupants into an ambiance of pure elegance. The seat upholstery can be also used to create the two tone combination on the dashboard as well as side panels that further enhance the sporty feel of the car in a significant manner. The long wheelbase of the car provides occupants with ample cabin space that is not often found in other sports sedan. The wraparound seats in front guarantees greater comfort and the all electric seat adjustment system helps the driver in achieving the best possible driving position. The rear bench with fold away central arm includes two cup holders as well as storage compartments that can conveniently accommodate three passengers. The ergonomic three spoke leather clad steering wheel, with controls for interacting with the main multimedia functions, frames a simple yet striking instrument panel. The large speedometer as well as rpm counter have sophisticated back-lighting, separated by 7- inch TFT display for displaying car's dynamic data in an effective manner. The car will not disappoint you on practicality front and the car is perfect for catering your diversified needs in an effective manner. The car offers a trunk space of 500-Litres that is quite impressive for carrying ample amount of luggage on long routes. The three variants of the car are equipped with a 3.0-Litre V6 engine which is potent enough to thrill you in an effective manner. The engine is designed in order to achieve lower fuel consumption and emissions that guarantees stunning sporty performance. The maximum power delivered by the engine measures 330 hp at 5000 rpm and maximum torque measures 500 Nm at mere 1750 to 4500 rpm. The next generation eight speed ZF automatic transmission helps in achieving high performance and precision gear shifting that further improves the performance of Ghibli in an effective manner. Individuals who are in constant search of concert-hall acoustics experience in a sports saloon, Maserati Ghibli will offer them with new generation Premium Surround System, which is evolved in collaboration with Bowers & Wikins. The music system is coupled with a 7-inch TFT touchscreen, 16 channel 1280 Watt amplifier and 15 speakers that blends perfectly into the design of the car and assures unmatched sound as well as dynamic purity to the occupants. The car's personality is given a more aggressive appearance by deployment of 18 inch diamond alloy wheels with tyre size measuring 235/ 50 R18. While 19- inch, 20- inch and 21- inch wheels underline the elegant and sporty spirit of the car in an effective manner. The Ghibli has been incorporated with Brembo brakes which are further coupled with dual cast discs that are evolved with perfect proportion of cast iron, and light weight aluminium. In order to ensure effective braking the brakes are accompanied with Anti- Lock Braking System (ABS), Electronic Brake Force Distribution System (EBD), and Brake Assist (BA). The swift handling of the car is the result of double wishbone suspensions at front and rear five arm multilink suspension at rear. Utmost power with state-of-the-art safety measures ensures that individuals can enjoy the ride with a peace of mind. Maserati Ghibli comes with a couple of stabilization programs like the traction control, which maintains maximum traction without wheel spin. Electronic differential control ensures faster response time while cornering. Other safety systems such as the anti-lock braking system, Electronic Brake Force Distribution and brake assist provides efficient braking at high speeds. Apart from these , front and rear seat ISOFIX child seat mounting is also equipped. Reinforced bumpers at the rear and front make the vehicle encounter sudden impacts. As for the security, the vehicle embeds electronic vehicle immobilization device. The air bag system (front, side and curtain), Hill Launch Assist (HLA), Electronic Stability Program (ESP) and Rear as well as front parking sensors further adds to the safety features of the car in an effective manner. What are the colors options available in Maserati Ghibli?